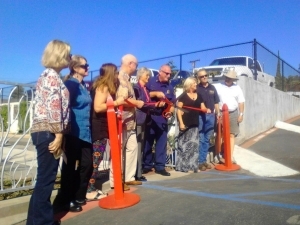 October 24, 2015 (Lakeside) - - An overflow crowd was on hand to witness the dedication ceremony for the newly completed Cedar Fire Historic Monument on Saturday October 14th at the Lakeside Fire District headquarters. 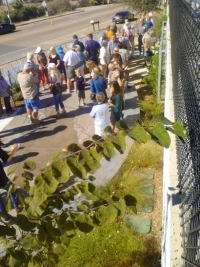 The monument includes a pocket park and honors first responders, those lost in the fire, as well as the strength and resilience of the survivors. 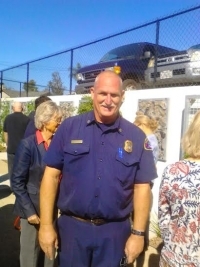 In attendance were Supervisor Dianne Jacob, Fire Chief Andy Parr, along with the Lakeside Fire District’s Board of Directors, the Cedar Fire monument committee, contractors, donors, and sponsors who dedicated time, equipment, supplies and labor to build the park. The Cedar Fire burned 280,278 acres, destroyed 2,232 homes and killed 15 people including one firefighter before being contained on November 3. 2003. It still ranks as the largest and deadliest wildfire in California history. 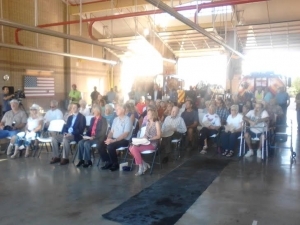 “Everything changed the moment the fire went into the city of San Diego,” she reflecting, adding, “since then $320 million have gone into fire prevention and protection.” Just then the sound of sirens and fire trucks leaving the station interrupted her speech. The walkway has inscribed the names and dates of past wildfires and on into the future. The walls will be adorned with art made from remnants of the destruction.